The Inner Sea region of the Pathfinder campaign setting is rife with monstrous foes, and 10 of the most fascinating are detailed in Pathfinder Campaign Setting: Inner Sea Monster Codex! From winged strix to aquatic gillmen, Golarion offers no shortage of iconic and inspiring antagonists to challenge any group of adventurers - and unexpected allies to aid them. Each entry presents a trove of informatiuon about the nature, history, society, and habits of one of Golarion's monstrous races, and ready-made examples of roles found among each creature type, from centaur foragers and cyclops lorekeepers to minotaur prophets and ogrekin looters. Charau-ka, fierce simian humanoids who worship demons and possess a thirst for bloodshed. Cyclopes, once part of a grand, ancient society but now reduced to a hunger sated only by sacrifice. Gillmen, amphibious humaonoids who claim to be the inheritors of the fallen Azlanti empire. Girtabilus, bold scorpionfolk who guard the mysterious ruins of Golarion's deserts. Strix, black-winged terrors intent on protecting their homeland from the human scourge. Sadistic derros, malevolent minotaurs, aberrant ogrekin, and more! 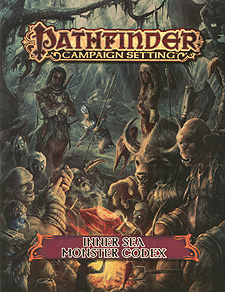 The Inner Sea Monster Codex is intended for use with the Pathfinder Roleplaying Game and the Pathfinder campaign settng but can easily be used in any fantasy game setting.